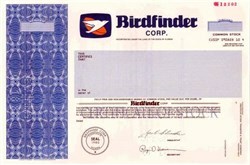 Beautifully engraved specimen certificate from the Birdfinder Corp. dated 1980. This historic document was printed by the Security-Columbian United States Banknote Company and has an ornate border around it with a vignette of the company logo. This item is over 23 years old. Non-Invasive Monitoring Systems, Inc. (NIMS) is engaged in research development and marketing of computer assisted, non-invasive monitoring devices and related software designed to detect abnormal respiratory, cardiac, and other medical conditions from sensors placed externally on the body's surface. These devices, including its flagship product, Respitrace�, provide diagnostic information regarding cardiorespiratory and sleep disorders in infants, children and adults; furthermore, alarms are sounded for adverse cardiac and respiratory events in critically ill patients.